When I launched simmonsmuseum.com in 2003, my intention was nothing more than sharing some pics and documentation and to use this site to check out web technologies. I neither expected much interest for my site nor for myself. The year 2009 once again proved me wrong and gave me many hexagonal highlights. My collection increased by two analog claptraps: One Musicaid and one Simmons (not documented yet, shame on me…). I picked up my fifth SDSV. A real bargain with a set of pure white pads in fabulous condition. My collection of catalogs grew: The total size of download files on simmonsmuseum.com passed the 1 GB borderline so I was forced to extend my webspace from 1 GB to 10 GB. I initiated my Youtube channel. Again more or less to experiment with technology. The first video was published on May 17th. Up to now I published 9 videos on this channel in order to provide demos of my gear. Already viewed by more than 10000 visitors so far. In Summer I visited Michael Buchner and wrote a report about his passion for electronics and research on electronic drums. There I also got to know Oli Rubow, probably the most famous drummer in electronic music in Germany. In October, I started my own wordpress blog. I discovered my passion for writing since I had the pleasure to write and publish a report about Simmons drums in Germany’s drummer magazine “Sticks”. Also in October I supported my Simmons Buddy Sibi by loaning him an SDX system for the Ludwigsburger Trommeltage. Since I optmized my Google ranking, simmonsmuseum.com has none less than 1800 visitors (1100 unique vistore) per month (source: Google Analytics) which is a lot for a private non commercial website. My guestbook had 71 entries in 2009 which is also an indicator for a vital website. Thanks for that! Hexagonal Christmas and a hexagonal new year! Did Simmons reveal it's own sound? As we all should know in the meantime, the SDSV rung in the age of electronic drums. The analog sound was a result of the technical stage at that time. And of course the way Dave Simmons developped his circuits (malicious gossip has it that ARP and Moog also considerably “influenced” Dave…) brought a random aspect in that what was later called “the Simmons sound”. But from that milestone on, every generation of Simmons drums increased the distance to that point of origin. How is that? The SDSV was released in a time when the digital sound generation already forged ahead. The Simmons company had a great product, but also a great portion of luck that they could sell it in a reasonable number. 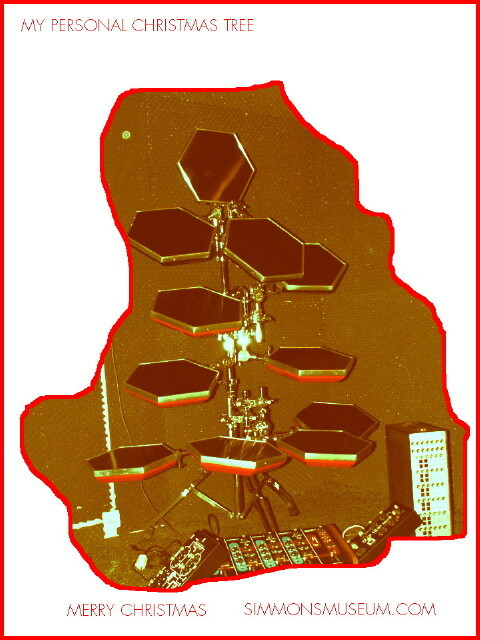 The SDSV HiHat and Cymbal modules had even already been based on samples. The analog sound was a period of temporary fashion. Every music epoch (since mankind is playing/singing music) requires it’s own sound and also drops the sound sources when the time is right for a change. If Simmons wanted to survive as a business company, they had to listen to the requirements of musicians and react. If Volkswagen would still offer the Beatle as their only car, the company would definetely not exist anymore. So the whole development was a matter of fashion and competion. If Simmons would have kept building analog drums only, they would have smashed much earlier. Still they embedded Simmons sounds. For example there were several SDSV libraries available for the SDX, the SDS2000 had a bunch of sampled analog sounds on board. You are currently browsing the Simmonsmuseum's Blog blog archives for December, 2009.